The Alpha Eye dry eye system is more effective at treating dry eye than just using stand-alone eye drops. Santa Cruz-Watsonville, CA (1888PressRelease) May 01, 2011 - Today, Watsonville-based brand builders Mackeonis & Associates announced that 'The Alpha Eye' dry eye mask from Dream Essentials will soon be available at Drugstore.com and Tools for Wellness, which will give long-needed relief to dry eye sufferers. This revolutionary system restores vital eye moisture comfortably and effectively, while sleeping or resting, and eliminates the 'sandy' feeling that most people with dry eye experience and actually improves eye health. Studies show that approximately 60 million people in the US suffer from dry eye. Aging is the number one contributor to dry eyes, as tear ducts prove to be less productive with age, but there are other causes as well. Contact lens use, computer work, smoking, air travel, low humidity environments, Lasik and other refractive surgeries, allergies, pharmaceutical drugs and various medical conditions, including diabetes can, all bring about dry eye. 'The Alpha Eye' dry eye system is more effective at treating dry eye than just using 'stand-alone' eye drops. Alpha Ulm, inventor of the patented 'The Alpha Eye' system and long time dry eye sufferer comments, "… It's my best 'friend.' I can't imagine living without it. It's always at my bedside. I take it on trips and wherever I go… I have become very accustomed to wearing it EVERY night. It works for me and it can work for you, too! She continues, "Relief can be felt for hours." 'The Alpha Eye' dry eye mask is soft and flexible and designed with an inner pocket that holds a special disposable liner, which slows down evaporation of natural tears and favorite eye drops, by forming an effective barrier. The liner rests gently over both eyes creating a moist environment around the eyes, while moisturizing the delicate skin around them. The inner liner can also be spritzed with distilled water to add extra moisture to the eyes. 'The Alpha Eye' is easy to use and can be applied for short periods during the day, or all night, so the eyes feel fresh and moist the next day. While hydrating the eyes, it also doubles as a black-out mask. 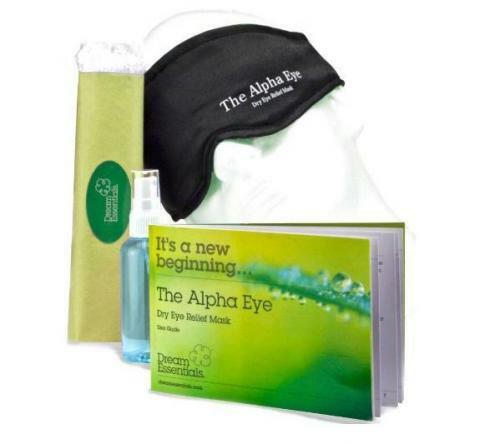 'The Alpha Eye' retails for $39.95 and includes the exclusive dry eye mask, 30 liners, a spritzer bottle for distilled water and a detailed instruction booklet. The optional liners can be purchased separately at $ 4.95 for 30. For more info about 'The Alpha Eye' dry eye mask go to www.alphaeyemask.com or www.dreamessentials.com .